Spring is well on its way, and it’s time to start planning your landscape! 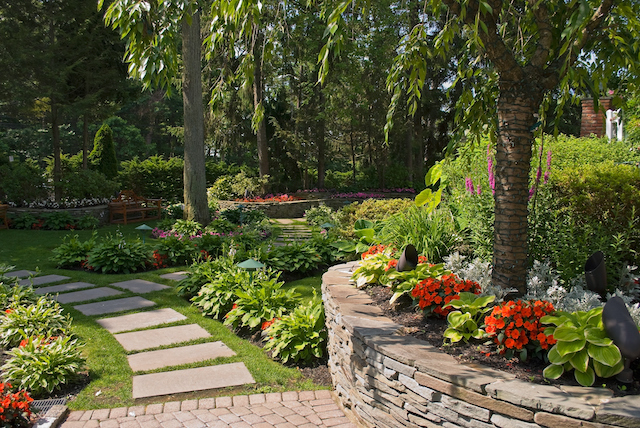 Spring is well on its way, and it’s time to start planning your landscape! Having a well-planned and designed yard comes with a wide range of benefits. It adds beauty and helps you enjoy your home more, improves your curb appeal and value, and depending on your design it can benefit the local ecosystem! Plus, your landscape is one of the most significant factors in first impressions to anyone visiting your home, making landscape design more than worth the effort. Having a walkway up to your front door is a classic landscaping feature that many forget. Not only does it keep visitors off the fragile lawn and garden, but it helps create a direct visual line to the front of your home. The effect this has on the way viewers see your house is impressive, even the most straightforward path can make your home look more inviting and well-kept. Using walkways throughout your landscape can also be a great way to highlight and explore your other features. If you have an extensive property with features out of sight normally, walkways can help you better enjoy them. Many make the mistake of relying on annual plants and plants from different regions or countries. When used sparingly, non-native plants can give your landscape oomph, but they should be used as accents rather than the bulk of your planting. Native plants are better suited to the place where they are growing, which means they will be healthier and require less upkeep. There are still plenty of stunning plants that will bring color and even attract more colorful wildlife, like butterflies and hummingbirds. Having an immaculate, green lawn is one of the most quintessential aspects of the American home, and you want to make sure to take advantage of that. But, don’t be afraid to break it up with more modern approaches. One French garden trend that we’re very fond of is the creation of garden plot like sections where carefully planned fields are allowed to flourish. These take some planning as you’ll need to create a perfect mix of flowers and grasses, but the end result is unique, stunning, and a beautiful way to create a more environmentally friendly yard. To get your free quote today, give us a call at 410-768-4720 or contact us via our website today. You can also follow us on Facebook, Twitter, and Pinterest to see how we’re growing! This entry was posted on Friday, March 29th, 2019	at 9:23 pm	and is filed under Landscaping Design	. You can follow any responses to this entry through the RSS 2.0	feed. Both comments and pings are currently closed.